Presented by Chris Smith, Diana O'Carroll. Researchers from University College London have shown that some of our perception of time is governed by observing how much the world changes. The researchers also think that through life we have learned that things in the environment change at an 'average' rate. So if we compare the changes we see to the changes we expect, our minds can estimate how much time has passed. Publishing in Current Biology, the researchers used two experiments to test their theory. For the first, twenty participants observed blobs of projected light appear twice. They were then asked which appearance lasted the longest. The light blobs were then projected alongside a mottled pattern which was programmed to change randomly, but at a regular average rate. This addition actually improved the participants' time judgements - which suggests that their brains used the rate at which the patterns changed in order to construct an internal time reference. For the second experiment the authors varied the rates at which the patterns changed and then asked the subjects to judge how long the mottled patterns lasted. When the patterns changed faster, the test subjects thought they had lasted for longer, demonstrating that a change in sensory input can alter our sense of time. Maneesh Sahani, who led the research, believes that because of the various types of sensory input and analysis that go into this timekeeping, there may be no single area in the brain responsible for it. 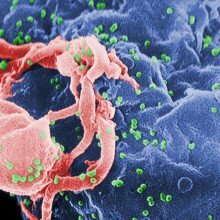 A mouse given a human immune system has enabled scientists to take the first steps in testing a new treatment for HIV, the immune-disabling agent that causes AIDS. Currently, HIV-infected individuals are managed using a strategy called HAART - highly active anti-retroviral therapy - which involves the simultaneous combined use of several drugs that target different components of the virus lifecycle. And whilst this approach has been very successful, helping many patients to maintain good health, the drugs themselves often have significant side-effects making them hard to tolerate for some patients, and the gradual emergence of resistance still remains a problem. But recently scientists have found another way to disable the virus, using short pieces of genetic material. One approach is to design short sequences of nucleic acid called siRNAs - small interfering RNAs - which are the genetic mirror image of certain essential viral or host genes. When these siRNAs enter infected cells they "cancel out" their target gene, preventing the virus from reproducing. Effective though it is, a significant problem is delivering sufficient quantities of these so-called functional RNAs into virally-infected cells in the first place. Now Colorado State University scientist Charles Neff and his colleagues, writing in Science Translational Medicine, have solved the problem by using another short piece of genetic material, this one known as an aptamer. These are molecules of RNA selected on the basis of their ability to fold into a certain shape so they lock tightly onto a target structures. The Colorado team have developed on of these aptamers to recognise an HIV protein called gp120, which the virus uses to infect susceptible immune cells. Alone, and when tested on cultured cells in a petri dish, this aptamer is very effective at neutralising HIV. But the team have now gone a step further. By coupling their aptamer, which they call A-1, to an siRNA molecule that targets two key HIV genes, they've found they can simultaneously deliver the small interfering RNA selectively to infected cells and with very high efficiency, whilst also directly neutralising viral particles using the aptamer. They tested this chimaeric molecule - called Ch A-1 - in mice that had been treated with human stem cells so that they make human white blood cells and can be infected with HIV. Compared with untreated control animals that maintained very high levels of circulating HIV and showed a 50% decline in CD4 white blood cells over an 18 week period, those receiving the new treatment rapidly developed an undetectable viral load in the bloodstream and maintained a normal CD4 count. The team checked these animals for signs of viral mutations that might lead to resistance to the new agent, but did not detect any consistent or reproducible dominant mutations. This suggests that this strategy could provide doctors with a potent new weapon with which to combat HIV, including HIV that has become resistant to existing therapies. The next step, say the researchers, will be to translate the treatment to a human clinical trial to assess its efficacy in real patients. Also in the news this week, researchers at Imperial College London have discovered an unusual process which is happening in a contagious form of cancer that infects dogs. 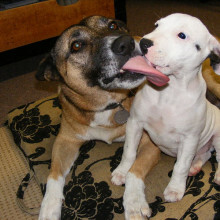 Canine transmissible venereal tumour, or CTVT as it's known, is spread by mating and it can also be transmitted by licking, biting, or sniffing tumour affected areas. The tumour cells then move from one animal to another and they establish a new tumour. But what this new study has revealed is that the cancer cells keep themselves healthy by stealing key cellular spare parts from the host animal. If the same is true of human cancers, it could hold the key to a host of new treatments for the disease and to tell us a bit more, we're joined by Dr. Clare Rebbeck, formerly from Imperial College, she's now at Cold Spring Harbour in the USA, and she's with us. Hello, Clare. Chris - Welcome to the Naked Scientists. First of all, can you tell us a bit more about the biology of this tumour, this canine transmissible venereal tumour? Clare - So this tumour is actually very interesting. It's one of only two types of tumour currently known that can be passed on from one individual to another and actually grows like a skin graft. With the dogs, it's able to go to any type of breed of dogs and can also actually be passed on to some of the wolf population as well. So, somehow it invades the immune system so the dog is not able to recognize that it's not part of itself and therefore, it doesn't reject the tumour until it grows. Chris - What was the specific question that you were looking to solve with the present study, Clare? Clare - So for this present study, we're trying to actually find more information about how the tumours were related to each other and trying to estimate some more information on the age of the tumour. We have actually done a previous study which tried to calculate how old the common ancestor of all the tumours that we collected were, so we actually collected tumours from seven countries in this particular study. On the previous study, we found that all the tumours from these countries all came from a single origin and that this was approximately only about 500 or 600 years ago. We were trying to use the mitochondrial genome for this present study which is another region in the cell which provides genetic information to provide more information about how old the tumour is. Chris - So you've got lots of samples of these tumours distributed from various places and you got DNA out of them and specifically DNA from these mitochondria, the little organelles in cells that give cells their energy, but which carry their own DNA so they're useful as a marker. So how did you then study their mitochondrial DNA? What were you looking for? Clare - So we're looking for mutations in the DNA. Over time, mutations arise and you can actually measure these mutations and they provide information on how closely related one tumour is to another, and also, how long it's been since these tumours have been separated, based on the number of mutations that have arisen between the tumours. Chris - And if you compare the numbers of mutations in just the DNA of the tumour, the normal cellular DNA, and the rate at which mutations are cropping up in this mitochondrial DNA, you'd expect them to be the same, were they? Chris - Why not? What was wrong? Clare - We expected there to be not so many mutations in either region, either the fast or the slowly evolving regions. But we found actually, there was much more variation between the tumours than we expected..
Chris - And how do you account for that? What do you think is going on? Clare - Well we think therefore that the mitochondrial genome is actually not part of the tumour per se. I mean, it hasn't come from a single origin, so we suspected then that the tumour has somehow been able to take up the mitochondrial DNAs from a different source which we suspect would be one of the host dogs, that it had grown on in some point in the past. Chris - Do you think it's taking up just the DNA of mitochondria from adjacent host cells or do you think it's scooping up entire mitochondria and bringing them in to the tumour cells to keep them healthy? Clare - So that's a good question and we're not entirely sure about that. We suspect that it's actually taking up the whole mitochondria and so the whole organelle. We think this because the original type of cell that this tumour came from acts as some sort of immune cell. So it's able to engulf foreign matter. So this type of cell, we suspect may then have the ability to engulf the mitochondria itself. Chris - If this is true, if it is taking up mitochondria on block like this and incorporate them into itself, does this mean the same could happen in any human tumour and this could be one of the reasons why cancers grow so successfully despite being genetically highly disorganized in humans and other animals? Clare - I think probably not because the need for it to take up the new mitochondria is mainly a result of the fact that the tumour is so ancient. In a normal person, their cancer is only as old as the person itself, so the number of mutations may not be sufficient, in order for it to require a new input. However, this may happen sometimes but it would be very difficult to be able to detect. Researchers this week have found that, for fact-based subjects, practising a retrieval exercise produces better test results than concept mapping. Based at the Purdue University, Jeffrey Karpicke and Janell Blunt ran several tests on 120 college students in the U.S. In their experiment, they had students create a concept map from a set text and then the tested the students on what they had learned. A concept map, for those that don't know, is a sort of spider diagram with lots of lines linking up ideas and facts. The concept map was actually developed in the 70s by Joseph Novak and quite a few institutions now encourage its use. The researchers then had the students complete a sort of reading comprehension or 'retrieval exercise' on the text and then tested them on what they'd learned. So the students were essentially being tested on the test and then tested again. What they found was that students performed better on the retrieval exercise than they did on the mind mapping exercise. What's more, they retained the knowledge for longer if they learned using retrieval. 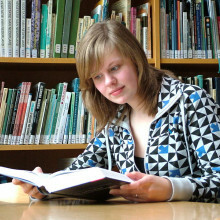 Publishing in Science, the researchers claim that it's both the act of recall and the act of reconstructing knowledge that are key for learning. But if you're still a huge fanatic of concept mapping you could, of course, combine the two by creating a mind map from memory. So if you want to do well in exams, just make sure you test yourself! There are many examples of organisms engaging in agriculture in the natural world, ranging from humans that grow wheat to leaf-cutting ants that nurture edible forms of fungi. 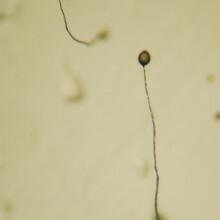 But now scientists have discovered what is possibly the smallest of nature's farmers - a single-celled social amoebal species called Dictyostelium discoideum. These microscopic soil-dwellers engulf and consume bacteria, multiplying in the process. But when food becomes scarce, Rice University researcher Debra Brock has discovered, they do something very interesting - about one third of the amoebae prepare a packed lunch. So, rather than exhaust the supply of bacterial food locally, they forego finishing their meal to instead sequester inside themselves some of the microbes they have been consuming. They then join up with other fellow amoebae to form a migratory multi-celled "slug" that moves up through the soil in search of pastures new. Close to the surface, the slug-like structure then produces fruiting bodies, called sori, which contain amoebal spores - complete with pre-packaged bacteria - that can be disseminated to colonise a new terrain. And when the bacterially-equipped amoebae emerge from their spores, the bacteria are used to "seed" new microbial colonies that can be consumed subsequently. What's intriguing is that only a fraction (36%) of the amoebae behave as "farmers" like this. The trait does appear to be genetic, because if mixtures of amoebae including both farmers and non-farmers are given a dose of antibiotics to sterilise them of any bacteria they may be carrying, those identified as farmers previously then pick up fresh stocks of bacteria. Now it remains to identify the genes that underpin this interesting behaviour, which may lead to a better understanding of how bacterial and other cells interact, including in a number of important diseases such as TB where carriage of bacteria within cells is a critical step in the pathological process. 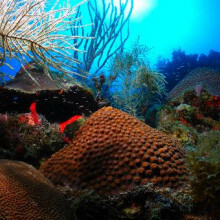 Chris - Coral reefs are regarded as the rainforest of the sea. They play a vital role in marine ecosystems and now, a new reef research unit at the University of Essex in Colchester has been setup to study them and Planet Earth presenter Sue Nelson has been to meet the Assistant Director Dave Suggett, and the Director Dave Smith. Dave Smith - We have a central large tank which acts asa whole ecosystem with corals, fish, numerous different types of organisms that make up a coral reef, and then around the outsides of the central system, we have a designated site which we use to fragment corals to grow for experiments. On the other side of the central system, smaller tanks where we can very precisely control the environmental conditions. From light levels to temperature, and in some cases water quality as well. Sue - We're in the doorway at the moment. Let's just go inside where it's even noisier and take at closer look at this large, central, rather beautiful tank. Can you give me an idea of the range of species that you've got? Dave Smith - Sure, yeah. It is quite noisy in here but that sort of mimics quite nicely what a coral reef is. It's a noisy, high energy environment and that's quite important for us to be able to mimic the sort of environment that we see in nature. We have about 22 different species of coral ranging from very highly branched corals to more boulder-like corals, and encrusting corals. We have soft corals which are part of the same family of the reef building corals, but don't produce the skeleton. And of course, dotted inside and within their little holes, and cubby holes of the coral itself, we have new and different species of fish. All of which play important functional roles on the reef, mopping up seaweeds and algae, and keeping the reef in check and balance. Sue - Is this coral all from one particular region? Dave Smith - This coral that we see at the moment, in fact, the 20 species are all from the IndoPacific region around Indonesia, the Philippines, which is actually the centre of coral biodiversity. So you find more species there than anywhere else around the world, and most of our research in the field is based out in the Indian Ocean and the Pacific. So we're mimicking a typical IndoPacific reef here. Sue - Dave Suggett, you're especially interested in looking at the effects of ocean acidification on coral. How do you go about doing that? Dave Suggett - Well ocean acidification is an exceedingly complex process. We're only just beginning to understand the carbon chemistry associated with that. As a term or a process, it effectively describes excess carbon dioxide from the atmosphere, entering into the oceans. Normally, oceans have a natural capacity to mop up that CO2, but with so much CO2 now coming from the atmosphere, it's exceeding this - what we called the buffering capacity of the oceans. So gradually, we're seeing a decline pH, making it less alkaline rather than more acidic for want of a better term. Why this is so important is that corals require inorganic carbon for several reasons. First of all, photosynthesis and secondly, they need carbonate ions to be able to form their hard shells which makes them so important for constructing coral reefs. Sue - How do you go about monitoring then, how much carbon dioxide a piece of coral is taking in? Dave Suggett - Well I think really of this as a key stone element of our research which was to try and take existing technology that's used in terrestrial systems, which can easily monitor carbon dioxide in the air and actually start to use that to monitor carbon dioxide in sea water. So in order to do that, we've taken technology from the medical industry where you have gas permeable tubes and it lets the gases permeate through them and then be measured by the terrestrial system. So this is a major step forward for us and for the first time, being able to measure carbon dioxide in sea water continuously and rapidly, alongside various other measures of the carbon chemistry. So we have a holistic view of ocean acidification. That's actually been very rare until now to do. Sue - Dave Smith, obviously you're not going to know exactly what's going to happen until you finish your experiment but you must have a crucial idea in terms of what the differing effects of carbon dioxide are going to have on the coral. Dave Smith - Absolutely. Coral reefs are so biodiverse and so productive because they're very physically complex. So any environmental conditions which decrease coral's ability to produce the complexity will have major consequences for the number of species a coral reef has and the half-a-billion people who depend on coral reefs for food. 23:18 - What is Antimatter? 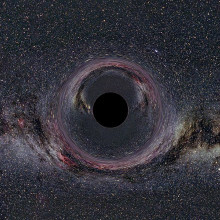 Diana - Antimatter is usually thought of as being rather mysterious. But in fact, it is much more abundant than you might think and it may well be the key to explaining some of the mysteries that surround the Big Bang. We're joined by Professor Andy Parker from the High Energy Physics Group at Cambridge University. Hello. Andy - Nice to be here. Diana - All right, very basic question to start off with then. What is antimatter? Andy - Well antimatter is an interesting thing, and it takes a little bit of history to understand clearly where it comes from. So back in the '30s a theorist, a British theorist called Paul Dirac was trying to put together the latest physics of his day which was quantum mechanics and relativity. At that time, quantum mechanics only really described things that were moving relatively slowly, relative to the speed of light. Whereas relativity told us that physics was different close to the speed of light and there were lots of new effects. So obviously, people wanted to put these two together. And Dirac managed to combine the two concepts into one equation, now known as the Dirac equation, and it's a beautiful example of the power of mathematics because he wasn't expecting to find anything other than small changes to the behaviour of electrons when they got very fast. But what his equations told him was that for every electron, which is a negatively charged particle, there was an exactly the same sort of state, but with a positive charge. It had the same mass, it would behave exactly the same way, but it was kind of the opposite. And furthermore, the equation said that you could take pure energy and turn it into an electron and a positron, so the antimatter partner of the electron is the positron, and he was quite baffled by this actually when he first saw it. It's interesting that he kind of didn't believe his own maths and he tried for a while to pretend that these positively charged particles had to be the proton which was the only positively charged one he knew of, but it had the wrong mass. Eventually, he accepted that this was actually a serious prediction of something called antimatter and that if you ran the equations for a proton, you get an antiproton, and if you did it for a neutron, you get an antineutron. So every type of particle should have its opposite - the opposite electrical charge, and if you bring the two together, they would disappear in a puff of energy. Diana - So antimatter basically came about as a result of mathematics. It was the only way to solve the equations. Andy - That's right. It was the only consistent solution to quantum mechanics and relativity. Diana - Okay and how does it relate to the Big Bang then? Andy - Well, okay so let me just say that this is not a theoretical concept any more. People have found antimatter. They found the first antielectrons in the '30s and the antiproton in the '50s, and we routinely make it and it's used in hospitals but, okay, how does it relate to Big Bang? Well the Big Bang was a state that started off with very high energy and that energy allowed the formation of lots of matter-antimatter pairs of particles, so you would expect naively that the universe were made of equal amounts of matter and antimatter because it was formed from the state of pure energy. But this is not what we observe. If we look at this studio for example, I've got a microphone, I don't have an antimicrophone, and there's nothing in the room which is blowing up around us so clearly, there isn't very much antimatter here. So you might think, well, okay, it's separated out. There's a region of the universe somewhere with all the antimatter in, and a region here with all the matter in. But if that was the case, there would be a boundary between the two and you would see along that boundary, you would see the matter and the antimatter annihilating. So you can look for that because it would produce a very strong source of radiation of the very particular wavelength given by the energy of the annihilation. And we don't see that anywhere in the universe. We've had satellites up, looking for antimatter particles coming from long away and whizzing by and the results so far have not really observed any unexpected amount of antimatter, other than what's being created from energy near us at the moment. So it looks as if the universe is only made of matter. So then you ask the question, why? Diana - I was actually going to ask the question - so we know it should exist, but how can we actually go about detecting it? Andy - Okay, that's quite straightforward. We have lots of different particle detectors that can measure particles and tell what type they are. So, if you had one that was looking for electrons, you would test the charge that is negative by applying a magnetic field and a positron will go the other way. Diana - All right, so what is the why then, why isn't it there? Andy - Okay, so what appears to have happened is that although matter and antimatter are very symmetric, that is they look like a mirror image of each other, there is some small difference in the physics between the matter and the antimatter. That is their interactions with the rest of the world are very slightly different and that means that when the universe started annihilating all the matter with all the antimatter, it didn't quite balance, even though they'd been created in equal amounts. It didn't quite balance. The rate is slightly stronger for antimatter. We know that most of the annihilation took place because we actually see a universe full of light which are the photons that came from this annihilation. But there's a tiny, tiny dose of matter leftover and that's what we're all made of, all the stars, all the galaxies, all the radio studios, are made of this tiny little piece that didn't manage to get annihilated. Diana - That's really quite profound. Okay, so you mentioned that light and radiation is emitted after annihilation. So, can we harness that? Can we use that? Andy - Well, we could if we could make a lot of antimatter, but we're not very good at making it. It is, in principle, straightforward. You take something with a lot of energy, say, a proton beam and you slam it into something like a lead target and some of that energy will make antimatter. So you'll get pairs of electrons and positrons, of protons and antiprotons made, and at CERN, that the Collider Centre in Geneva, we do this routinely and I used to work on an experiment actually where we collected antiprotons in order to annihilate them with protons and see what happened. But you don't make very much. It would take thousands of millions of years to make a bottle of antimatter, so although we can make enough to do experiments, we can't make enough to make large quantities that you could use as an energy source. Diana - Seems like a shame really, doesn't it? Andy - It will cost you a lot more energy to make than you would ever get back. Chris - In November 2010, researchers at CERN announced that they had managed to make and trap the antimatter equivalent of hydrogen, so-called antihydrogen. Jeffrey Hangst is one of the scientists behind that breakthrough. He joins us now from Geneva. Hello, Jeffrey. Chris - So first of all, tell us why were you wanting to trap antihydrogen? What was the reason for doing the experiment? Jeffrey - Well, our long term goal is to study if there really is a difference between the physics for matter and antimatter. We'd like to do that by comparing hydrogen and antihydrogen. Hydrogen is something we understand very, very well. It's kind of the model system for quantum mechanics. It's how we learned how to do the physics with atoms. So, we now know how to make antihydrogen atoms and we've just recently learned how to trap them, so we'd like to shine some light on them if you will, to see if hydrogen and antihydrogen behave in the same way. The laws of physics, as we understand them now, say that those two things should behave identically. Chris - So it's one of those things, you start with something very simple and work out how the simplest thing works before trying to get clever and looking at more complicated things. Jeffrey - In this case, it's also the only thing in terms of atoms that you can imagine making out of antimatter. Chris - Indeed. Well perhaps you could tell us then how you actually went about making antihydrogen. Jeffrey - Okay. First, you need the components which are antiprotons, the nucleus, and positrons which are antielectrons as has just been explained by Professor Parker. We are at CERN because CERN has a machine that makes antiprotons. It's called the antiproton decelerator. You run protons into a target and you collect antiprotons which were some of the particles that come out of that interaction. So CERN has this wonderful facility. It's unique in the world where they can collect some antiprotons for us and in addition, they can slow them down. These antiprotons are made at high energy and we'd like to have our antihydrogen atoms essentially at rest. We'd like to have antimatter in a bottle, if you will. So this machine does the first step. It takes the antiprotons and slows them down to an energy where we can manage them. What we then do is slow them even further and trap them in a kind of electromagnetic bottle, in almost sort of the best laboratory vacuum you can make. Matter and antimatter don't like each other so you need to deal with your antimatter in a vacuum. So we have a device that slows and stops antiprotons. The same device can also slow down and stop positrons from a radioactive source and then we combine the two. So, negative antiproton meets positive positron, they can combine and form an atom, and that atom is antihydrogen. Now, we've been doing that particular thing since 2002. What's new is that we've managed now to hold on to the antihydrogen atom. Chris - I was just going to ask you about that because the first steps that you explained are relatively easy because those particles have got charges on them, which means you can guide them with magnetic fields and things like that because they will experience forces in magnetic fields, won't they? But once you actually combine them and you make your antihydrogen, they're now neutral. So, how do you then confine and constrain, and control them then? Jeffrey - Yes. Relatively easy is exactly the right word because the first step took about 15 years, the making of antihydrogen. But what you do now, although the antihydrogen is neutral, it has a small magnetic character. You can think of an atom as a minute compass needle, so it can be deflected by very strong magnetic fields. So we can use that interaction to hold on to the antihydrogen atom, even though it's neutral. The rub is that, that interaction is so weak that when we take the best magnets we can fabricate today, the deepest bowl, if you will - imagine you're holding your antihydrogen in a magnetic bowl. The depth of that bowl will only hold an antihydrogen atom that is 0.5 degrees Kelvin above absolute zero, right? So it has to be extremely cold. Otherwise, it just runs away. Chris - Because otherwise, it's moving too quickly and trying to hold on to it when it's going that fast is very hard. Jeffrey - Again, imagine a marble rolling in a bowl. If the marble was going too fast, it goes over the lip. Our bowl is very shallow, so these antihydrogen atoms need to be moving very slowly and in temperature equivalent, slowly means half a degree above absolute zero. Chris - Pretty chilly. Once you get it down to that sort of level, how long can you constrain and confine the antihydrogen so that you can study it? Jeffrey - In the article we published, it's a bit misleading because we were just trying to show that this was possible. So, we produced our antihydrogen in the bottle and then released it as quickly as we could to see if it was still there. In that experiment, it was about 2/10th of a second. We can now hold on to it much, much longer, a thousand seconds. Chris - That's a very long time. Jeffrey - Yes, that's a very long time. Chris - So long enough in other words, to begin to ask some important scientific questions about the characteristics of the stuff you're making and constraining. Jeffrey - Exactly. That's the next step which we hope to start on in May when the accelerator starts up again. Chris - In the last couple of minutes, let's talk then about what you can learn from this because one of the interesting things that we see when we look out into space, we can use physics that Bunsen of 'Bunsen burner' fame taught us, which is that we can work out what things are made of by looking at the way they interact with light. They absorb or emit light at characteristic wavelengths and that's how we know what distant stars are made of, for example. Does an antimatter material like antihydrogen - does that have the same absorption spectrum that normal hydrogen does? Jeffrey - That's exactly the question that we'd like to answer. The standard model of physics says that it must, but there are no measurements yet on antihydrogen. So, we would like to start that as quickly as we possibly can. We're going to shine both light and/or microwaves on antihydrogen atoms to see if they absorb and emit exactly the same colours or frequencies if you will, of electromagnetic radiation. So that's exactly the question we would like to answer and to see if there's some asymmetry between those two systems. The difference between high energy physics and this type of physics is we can make precision measurements - the hydrogen atom is so well known, to one part in 10 to the 15 - that's a lot of zeros. So we can make precision comparison rather than going to a very high energy and looking for something new, we look for very small differences in a system that's extremely well understood in the matter sector. Meera - For this week's Naked Engineering, Dave and I have come along to the Addenbrookes Biomedical campus to investigate antimatter, but more specifically, just how antimatter can be used for medical imaging. So here to tell us a bit more about this is Dr. Richard Ansorge from the Cavendish Laboratory at the University of Cambridge. Now Richard, if you could just set the scene then as to what are the different types of medical imaging? Richard - The oldest type of medical imaging is just straightforward x-rays. Although these days, that is usually done as a CT scan which actually gives you a 3-dimensional X-ray image by combining many slices. In the 1980s, I guess it was, Magnetic Resonance Imaging [MRI] started to be developed based on the magnetic properties of the hydrogen atoms in all the water molecules, and other organic molecules inside every living person. Dave - So because you're looking at the hydrogen atoms rather than x-ray, which is just looking at the really heavy atoms in your bones, you can see a lot more detail of the soft, squishy bits. Richard - Yes, that's exactly right. One of the major applications of MRI imaging is, for example, to look at people's brains. Richard - Yes. PET stands for Positron Emission Tomogrpahy, the positron of course is the antimatter equivalent to the electron, and is like an electron except for the fact it has a positive charge. It's possible to manufacture radioactive isotopes that will emit positrons, for example Fluorine-18, which has a 2-hour half life, is used a great deal in PET for example in a molecule called FDG which is a glucose analogue. When injected into a patient, it will be metabolised and the radioactive Fluorine tends to accumulate in positions in the body where the tracer has been metabolised. The end result of that is that one literally has hot spots of radioactivity, in places where there are hot spots of metabolic activity. Dave - So for example, your brain or especially I guess a tumour will be very, very active and respiring a lot so taking in a lot of glucose, so that will be very radioactive. Richard - Yes and so, for the last 20 years or so, PET has been used mainly for oncology. Meera - Metabolic function is the end result, but how does a PET scanner actually work to find where those metabolic areas are? Richard - What happens is that the radioactive substance decays to produce a positron which wanders around in your tissue, travelling typically a millimetre or less and then meets a normal electron in another atom, and annihilates with it. The electron and the positron disappear and 2 gamma rays, each having an energy equivalent of the rest mass of an electron and positron are produced, travelling in fairly precisely opposite directions. Dave - So this is the E=mc2 thing where all of the mass of the electrons has been converted into energy in those photons. Meera - And these are what are essentially picked up by detectors in the scanner. Richard - Yes. An important feature is that 2 gamma rays are produced and are detected simultaneously. That means that since you have injected a radioactive substance, there are a lot of background counts, but the coincidence of the arrival of two gammas tells you that you've actually got a good event associated with the decay, somewhere on a line, joining the two detectors that went off. Dave - And then I guess you just look at many, many events and you know all of these appeared on lots of different lines, and somehow you've got to work out where the original radioactivity was? Richard - You can run quite complicated mathematical algorithms on these lines of response to reconstruct the most probable distribution of the tracer. It's a three-dimensional image for each small volume region in the body, showing the number of decays that were detected from that region. 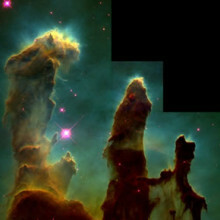 Typically, these images are displayed in false colour. So you get different shades of colour representing the intensity of the emission. Meera - But what about positioning it say, within our actual bodies? Richard - Tissue which is not absorbing the tracer is invisible in a PET scan. So, it can be problematic, locating where a suspected cancer is actually located. Is it in a lung or is it somewhere nearby? Meera - And so I guess to get around that problem, a recent development has been the combination of PET scanners with CT scanners to then get the structure and the metabolism. Richard - Yes, that's right. Dave - This has all the same disadvantage of a normal CAT scan. It's really finding the bones, but not so good at the soft tissues. Meera - This is where your research really comes in, Richard. So we're currently in an imaging suite, standing next to a large PET scanner, but this is a combined PET/MRI scanner, which is what you're developing. Richard - MRI gives different types of contrast as compared to CT. So for example in the brain, you can get a much more accurate view of where the PET activity is taking place. 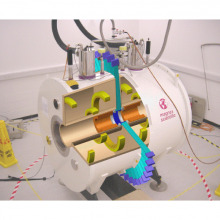 There are a number of technical challenges involved in combining PET and MRI. The photomultipliers used in PET scanners don't work in magnetic fields which are essential for MRI scanners. Meera - How, with your design, have you tried to overcome these problems? Looking at the scanner now, it's a large, white cylinder, about 3 metres long and there are "wings" attached to the centre of it. Richard - If you look carefully at our system, you'll see that whereas a conventional MRI scanner is a single cylinder, we have sliced our scanner in the middle and opened up a gap. The gap means that we can put a conventional PET detector in the centre of the magnet and the light that's produced can be brought out of the magnetic field using fibre-optic guides, travelling transverse to the axis of the magnet, and end in a region where the magnetic field is sufficiently low, that the photomultipliers will operate satisfactorily. Dave - So the wings which Meera mentioned earlier are basically the ends of these light guides and all the electronics. Richard - Yes, that's right. So the end result of that is that our system has a sensitivity of about 5% which actually compares fairly favourably with unmodified systems which would be 6 or 7%. 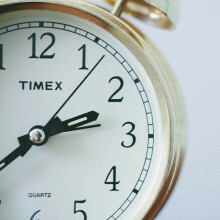 A further advantage is that, unlike combined PET/CT systems, where the CT is run once as a quick snapshot at the beginning, the MRI can be run continuously, for the 10 minutes or so that the PET scan goes on, and one can track, for example, breathing, and allow for that to make much higher quality images than is possible with a PET/CT system. 44:43 - How much energy is released in antimatter annihilation? How much energy is released in antimatter annihilation? Andy - In scientific terms, it's about 10-13 Joules which means you'd need to do that about a thousand, million, million times to warm up your cup of tea. 45:16 - Can antimatter make antimolecules? Jeffrey - Theoretically, yes. The problem there is ever making any antimatter atom other than anti-hydrogen. That's just not on the cards. That's so improbable that we don't even talk about doing that. Chris - Why is it so difficult? Why couldn't you do that? Jeffrey - You need a lot of energy to create your anti-matter in the first place. The anti-proton is the lightest nuclear antimatter particle to go to even anti-helium takes much more energy and is much more unlikely. So, that's just not in the cards for the way that we do things today. 46:07 - Would an electron and positron orbit each other? Would an electron and positron orbit each other? Jeffrey - Absolutely. They make a system called positroneum which is a sort of a mini atom made of one positron and one electron, and that has been studied extensively. Also the spectrum of positron in positroneum has been studied. The problem with that thing is it doesn't live very long. About 140 nanoseconds in its long lived form so it's difficult to study. Anti-hydrogen is stable, that's why we want to go with that. It's also a pure antimatter system. Positroneum is half matter, half antimatter. 46:47 - How do positrons in a PET scanner annihilate only electrons in our body and not surrounding material? How do positrons in a PET scanner annihilate only electrons in our body and not surrounding material? 47:20 - Do matter and antimatter attract each other? Do matter and antimatter attract each other? Andy - If you just take a positron and an electron, they attract each other because they've got opposite electrical charges. But a much more interesting question is if you make a matter atom and an antimatter atom, do they then attract each other? Because if they were two atoms, they would have a positive pull together from gravity. So an interesting question which I think Jeffrey might like to comment on is whether there's some anti-gravitational force related to antimatter... Jeffrey - It's a very fascinating question and an experimental one that another group here at CERN hopes to answer. The short answer is that nobody knows because physics is fundamentally an experimental science, but people are planning on doing that experiment. Maybe in five to ten years, we'll have an answer. Most people don't think that there's antigravity. In other words, that antimatter and matter repel each other, but there may be some slight correction to the attraction. That's what the current thinking is, that's as far as it goes at any rate. 48:24 - How do we detect antimatter in space? How do we detect antimatter in space? Andy - Well, it depends which sort of antimatter particle we're looking for, but basically, you have lots of detectors which can tell the mass of particles, and if you put them into a magnetic field, they bend one way or the other, depending on their electric charge. So if we see something with a proton mass and a negative charge, then we identify it as an antiproton, and similarly for anti-electrons which are the dominant things that you would expect to see coming at you. 48:59 - Does an anti-universe exist? Andy - It seems unlikely. I mean, there's nothing in principle to stop you having a Big Bang that created an anti-universe rather than a universe made of matter. But what we do see is that there is no obvious place where there's a lot of antimatter annihilating a lot of matter. So if you wanted to make an anti-universe, you'd have to separate it completely from the matter one or at the point of contact there would be lots of emission of gamma rays as everything annihilates and we see no such source. So, the idea that there's a chunk of the universe which is all antimatter seems to be ruled out experimentally, at least as far as we've looked so far. Now whether there's an anti-universe hiding down some strange extra-spacial dimension is a completely different question. I'm actually looking for extra-spacial dimensions at the moment, but I don't think anyone is seriously expecting to find an anti-universe at the end of them. 50:02 - How can matter and antimatter be annihilated? How can matter and antimatter be annihilated? Andy - Well they have opposite quantum characteristics, is the technical answer and so, once you put them together you get a kind of null state which has nothing left except its energy. 50:21 - How can light bend? If light has no mass, and gravity is a property of mass - then how is light bent by gravity? Andrew - Regardless of the mass of the object, the acceleration caused by gravitational pull is the same for any object. Now, Newton came along and gave a mathematical explanation of this and the maths essentially is that mass appears on both sides of the equation which governs this behaviour. So it actually cancels out. But if the mass is actually zero, then it's no longer really mathematically valid to do that cancellation. Nonetheless, it's certainly true experimentally and mathematically that as you go to smaller and smaller masses, these things are still deflected in the same way by gravity. But since this sort of mathematical paradox of trying to divide by zero, that isn't conclusive. To get the full mathematical answer actually requires coupling a description of what we call electromagnetic waves, that's the kind of physics underlying the wave light travels, to Einstein's theory of gravity which is general relativity. Only then do we get rid of this paradox of dividing by zero and end up with a conclusive answer that shows that just as objects of any mass are affected by gravity. So light, which has no mass, is also affected by gravity. Diana - So, what is it that relativity tells us about gravity that can help us solve the problem? Andrew - So in the end, Einstein's description of gravity which is general relativity tells us that the effect of gravity is caused by distortions in space and time itself. Now if you do something as fundamental as distorting space and time, and reshaping it, anything that lives inside space and time will be affected. That includes waves, and so, waves can be bent and can follow different paths if you change the geometric properties of the space they live in. Previous Where Does the Time Go?